A few days ago, several media reports said that Zhejiang Xingrun, a private property developer in Fenghua, Zhejiang province, is likely to default on 3.5 billion yuan ($573 million) in debt owed to several banks, as well as other obligations. The default of Zhejiang Xingrun Real Estate Co may portend difficult times ahead for small developers amid emerging risks in third- and fourth-tier cities, analysts said. The real estate difficulties main reasons are: oversupply in smaller cities, significantly slower growth rates, poor management and weaker profit margins. But defaults will be limited to smaller companies, as larger developers can lower their risks by diversifying into multiple markets, underscoring the importance of scale. They have better access to capital than smaller developers. Large developers can obtain construction funding from banks at 6 percent to 9 percent, whereas small ones pay up to 20 percent. Most of them have turned to trust financing as an alternative to bank borrowing. According to statistics, the sales value of residential properties in China went down 5 percent year on year to 598.5 billion yuan in the first two months, while the amount of housing floor space sold during the period went down 1.2 percent year on year. As a consequence, many local property developers have now given direct price cuts to buyers. Fifty-seven out of 70 major cities tracked by the National Bureau of Statistics (NBS) still saw new home prices increase in February. However, month-on-month price increases in the 70 cities declined from 0.4 percent in January to 0.28 percent in February. Following the decline in housing prices in many small and medium-sized cities, such as Hangzhou and Changzhou, the major cities growth has been cooling, as it is the first time for the four first-tier cities to see year-on-year price growth below 20 percent since September 2013. 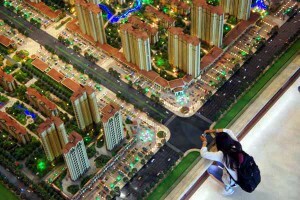 Shanghai led the rise with a year-on-year increase of 18.7 percent. Beijing’s price rose by 15.5 percent. Guangzhou and Shenzhen both saw a 15.9 percent increase. The tightening of credit and the slower salary’s increase, compared to house pricing increase, are the main reason of this cooling down. Vanke Company, one of China’s largest property developers, two weeks ago reported that one of its residential buildings in Beijing entered the market at a price 3,000 Yuan（$484.47）-per-square meter less than previous market expectations. Analysts say it is a good indicator, as the market become more and more rational.